I am a 49 year old married mum, with a delightful son, Callum, and a caring husband, Jim. I worked full time for the whole of my career, from the age of 18, in acute nursing. For much of this I enjoyed being the expert lead, for the two local hospitals (Hull Royal Infirmary and Castle Hill), in caring for people with difficult and life threatening wounds. My wonderful life was utterly devastated by terrible news on 24th February 2014. A day burned into my memory. I was told that the vague symptoms I had been putting up with were in fact from colorectal (bowel) cancer. I had just celebrated my 46th birthday and my immediate concern was that Callum was just eight years old. The medical team believed initially that my cancer was of a curable kind, but unfortunately the cancer was soon to show that it was much more aggressive. I was started on a gruelling five week course of daily chemotherapy and radiotherapy, the side effects of which hospitalised me for most of this time. A scan prior to my major bowel surgery identified some secondary cancer spread to my liver, but the supportive medical team were still of the opinion that I was in a curative stage, if liver surgery was successful. In preparation for liver surgery, and following my bowel surgery, I required an additional full body PET scan. This was necessary to reveal any other suspicious cancer-related activity. Tragically, during a further hospital stay, my very caring consultant had to deliver the life changing news from the PET scan. My cancer had aggressively spread further, throughout my lymph system. I was now suffering from stage four cancer, a currently non-curable type. I knew that there was no stage five, so it looked like the end of line for me. Rapidly following this terrible news, regular scanning showed that the cancer had spread again and was now into my lungs, close to my heart. I now had cancer in my liver, lungs and lymph system. These are all common places bowel cancer favours spreading or metastasising into. My life, and the lives of my family and friends, would never be the same again. This included Jim and I no longer feeling able to work, dramatically reducing our income, but giving us precious time together. How long would I live? 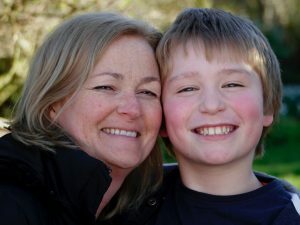 Being a mum with a young child, my driving aim was to be there for him as long as I possibly could be. To nurture and protect him beyond anything else. There for major milestones and challenges as he grows into a young adult, in this difficult world. Taking on challenges that I’m not going to have the privilege of supporting. I am also tortured by the profound and everlasting impact my early death will have on my son. Fearing it could throw him off course. Stopping him from ever attaining his full potential. 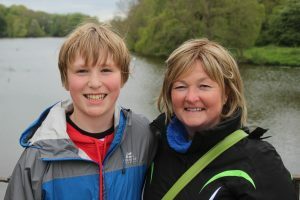 Cancer would rob him of his mum, a very special and irreplaceable relationship. I also thought I’d enjoy growing old and grumpy with Jim and be there with my sister to help ensure my mum and dad are safe in their old age. Looking at my death in the face has made me question all my priorities. Planning for my family’s future without me in it. Focusing on creating as many good memories for Callum and Jim as possible. Ensuring that they could both manage without an organised woman in their lives. However, when you are permanently unwell and drained of energy from endless rounds of Chemo, it is so hard to do. Everything is a massive effort, which exhausts me for days on end. Also, some of the difficult conversations I have felt it fair to have with Callum have been heart-wrenching. Conversations like possibly soon losing a mum, that you never imagine even having to consider having with an eight year old child. Being given the news that my cancer was “incurable” was when I feel my real plight started. Anyone who knows me realised that I was the type of person who was going to fight sensibly all the way. To stay alive for my family for as long as possible. Being there for my wonderful son and caring husband. This meant facing up to life long two weekly energy draining palliative chemotherapy. Even as a nurse of 29 years, I didn’t realise that such a gruelling regime existed. I thought I’d misheard my consultant. How long could I possibly withstand such a harsh treatment. What would my family’s quality of life be? I’d already been through five weeks of constant chemotherapy-induced vomiting and lethargy. This had been so hard for us all. Realisation dawned that my cancer journey had only really just begun and that there were many more challenges and lows for my family to get through. Initially there were more hospitalisations, but slowly my body has somehow adjusted. Jim, has tenaciously invested endless hours researching my specific type of cancer. Looking for sensible evidence-based treatments and additional things I could do for myself. All helping me to help stay well, positive and give me some hope despite the terrible statistics/prognosis. We also invested some of our savings in affordable private credible treatments and expert advice, in the hope of keeping me alive for my family. Three years on, I have blessed my good fortune for every additional day with my family and friends, but know that time is rapidly running out. A recent scan has shown that my lung tumour has started to grow. As is always the case, the palliative chemotherapy is losing the battle with my mutating cancer. My good fortune has continued. Our restless research, and support from a fellow expert patient, pushed us to request genetic testing. Specifically to find if I had a rarer subgroup of bowel cancer, classified as being MSI-high. Although such cancers are aggressive and full of mutations, they have also been found to be more likely to respond to a powerful new immunotherapy drug called Pembrolizumab (Keytruda). The drug basically unmasks the tumours, unleashing my own immune system to kill the cancer. Ending the need for further damaging life-limiting chemotherapy. This immunotherapy could extend my life by years, something chemotherapy cannot offer. Unfortunately, although approved for my rare cancer sub-type in America (and even for some kinds of skin and lung cancer in the English NHS), NICE are excruciatingly slow in reviewing whether they should do the same. Until they do, Keytruda is only available to me privately and without the substantial discount the NHS enjoy. I feel like I’ve cruelly been given a death sentence reprieve that will arrive too late! I value the NHS and loved working for this organisation for 29 years. Never during my caring career, looking after thousands of patients, did I ever think that the NHS would fail me in my own time of need. But it is failing me now! The drug approval mechanisms in the NHS seem so constrained and set you up to fail. The NHS are rationing, without meaningful debate. Taking away the possibility of extending my life so that I can nurture my son as he grows up and have the privilege of enjoying a normal family life. My application to NHS England for exceptional funding, in lieu of the outstanding NICE review decision, was rejected. NICE’s approval process, started over a year ago, remains stalled, with blame placed on the drug company. In desperation therefore, I found a local professor of oncology who can offer me private Keytruda treatment at Castle Hill Hospital. Despite the daunting £100,000 plus per year cost, potentially required over two years, I have commenced treatment and feel really well after two treatments. Thus, having raised a magnificent £75,000 to fund the treatment privately, I need to continue with my fundraising to meet the full cost of the two year course of treatment. Thank you for reading my story, consider donating, and please, please share my story with as many friends/acquaintances as you can. Any funds raised will go directly to my treatment, or to immunotherapy research if I should not be able to continue.